Reference number for this case: 11-oct-54-Oleron. Thank you for including this reference number in any correspondence with me regarding this case. Among the few truly ridiculous stories that the Press had published widely, without any investigative work, perhaps just to amuse, there was that of the encounter with "two pretty Martian woment" by a so-called teacher in the island of Oléron in the Charente-Maritime. For example: "Here is the visit that everyone was hoping for: the Martian girls. It was Mr. Martin who was delighted to be the first to welcome them." "Mr. Martin is currently on vacation in the Island of Oléron, and is resting, watching the waves and pine forests, from the heavy climate of Africa under which he teaches reading and writing to the little blacks. His favorite pastime, the one he made on Monday, will mark his memory in any case. At the turning of the road that blossomed good in autumn, he saw two pretty people whom he identified as Martian women. They measured about 1m70, were booted, gloved, and leather-covered, and Mr. Martin, scarcely recovered from his surprise, tried to begin a conservation, but failed to make himself understood." "Then the two Martians grabbed his pen and notebook to write incomprehensible signs." It is concluded that "Mr. Martin kept this manuscript piously." Two pretty Martian girls give an autograph to a French teacher! Flying saucers are decidedly not finished surprize us. So far the pilots of these celestial machines were hairy gnomes or unsightly giants who although polite did not give us a particularly encouraging vision of the Martian humanity. PARIS, Oct. 13. - A schoolmaster on leave from one of the French colonies has capped France's "flying saucer" serial with a tale about two young women from Mars. M. Martin said he met the two Martians on the island of Oloron off the French Atlantic coast. They were about 5'-7" tall, wore leather helmets, gloves and boots and were very good-looking. They borrowed his fountain pen and scribbled some mysterious signs on it. M. Martin could not read the writing but he kept it as evidence. Flying discs, balls and cigars have again been reported everywhere from the Pyrenees to Alsace and back to Britanny in the past 24 hours. - Reuter. On his side a colonial teacher currently in holidays in the island of Oléron, Mr. Martin, claims to have encountered in the island two pretty girls from Mars measuring approximately 1,70 meters, wearing boots, gloves and a leather helmet. The two Martians took Mr. Martin's pen, and traced incomprehensible signs on his notebook, while trying make them understandable. Mr. Martin is said to have carefully preserved this manuscript. The author indicates that on October 14, 1954, Jules Martin, schoolmaster, swears that in the island d'Oleron, he encountered two pretty ladies from Mars, in leather helmets, gloves and bootees. The ladies from Mars had borrowed his fountain-pen, jotted down some hieroglyphs, then taken off without making a date with him. Although they were greatly outnumbered by the saucermen, saucerwomen also were reported. A vacationning schoolmaster, M. Martin, said he met two beautiful young ladies, presumably from Mars, on the Island of Oloron [sic], off the French Atlantic coast. One report had them about four feet tall, another five feet, seven inches, but all dispatches agreed they wore leather helmets, gloves and boots. They borrowed M. Martin's fountain pen and scribbled some mysterious signs for him on a piece of paper, which he had kept as evidence of the interplanetary encounter. "On October 11, in the island of Oléron, Jules Martin saw two "ladies" close to an object on the ground (not described). The entities borrowed Jules' pen to trace some hieroglyphs before leaving." They add that according to Le Figaro for October 13, the ladies are described as "two pretty Martian measuring approximately 1.70 meters, with boots, gloves, and helmeted of leather." The authors comment on that Mr. Martin was quite lucky since normally the encountered creatures are rather ugly. Invention of M. J. Martin who observed two pretty Martian girls. Communication by M. Duquesnoy and B.B. p. 80-81. The authors indicate that on October 14, 1954, in the island of d'Oleron, Bay of Biscay, France, schoolmaster Jules Martin claims to have encountered two beautiful females from Mars wearing leather helmets, boots and gloves. The Martian girls borrowed his pen to write down hieroglyphs, then left, apparently flying off. The authors indicate that their source is Harold T. Wilkins, Flying Saucers Uncensored (New York: Pyramid, 1974), page 245, originally published in 1955 by Citadel Press (New York). The Belgian ufologist indicates that on October 11, 1954 in France on the Island of Oléron, Jules Martin, colonial school teacher on vacation, observed two delighful "Martian" females close to an object posed on the ground. These two women wore ankle boots and leather gloves, as well as brilliant helmets, and before leaving they nicely agreed to give an autograph to the teacher. The author indicates that the source is Samedi-soir for 10/14/54 as well as J.L. Rivera. The author specifies that actually the witness would have entirely invented this alleged encounter, and she indicates as source for this explanation "Les apparitions d'humanoïdes" by Eric Zurcher, Alain Lefeuvre publisher, 1979, page 179. A schoolmaster, Jules Martin, encountered two beautiful females wearing leather helmets, boots, and gloves. They wrote down some symbols on the sand before departing in a silvery flying disc shaped object. No other information. 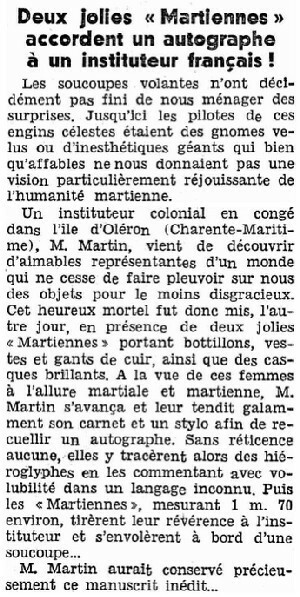 Jules Martin, a colonial teacher on leave, observed two delighful "Martian women" near an object on the ground. The two "women" were wearing boots and leather gloves, as well as shiny helmets. Before leaving, they agreed nicely to give an autograph to the teacher. He indicates as source: Samedi-Soir for October 14, 1954. He adds that in reality the witness "is said to have invented this alleged encounter." He gives as source of the explanation: Eric Zurcher, Appearances of humanoids, page 179, quoting a communication of Mr. David Duquesnoy. The story made the delights of skeptical ufologists. As a negative case, it shows that invented stories can describe extraterrestrials that bear no resemblance to those in more serious reports, and that invented stories lack any continuity and consistency, as the sequence of the arrival and departure of the Martian girls is missing and as the supposed saucer is not even mentioned. The autograph signing too shows how the fantasy tale did not refrain from describing alien behavior that the passing of time makes utterly nonsensical. There is a ufology school of thought that claims that aliens are too absurd to be aliens and thus all the close encounters of the third kind and UFO sighting reports are to be interpreted as "paranormal" phenomena, or visions of some "other realm" rather that extraterrestrial visits. Such cases are used as examples for this sort of thesis, by ignoring that plain hoaxes can simply be nothing more than plain hoaxes and thus should not be viewed as bona fide reports that require exotic explanations. This particular case makes me wonder whether it was not simply a story invented by some newspaperman for ridiculisation purpose: "Jules Martin" sounds as a made up name, and it does not seem that anyone ever spoke to this Jules Martin. Also conveniently, Mr. Martin is said to have been on holiday on the Island of Oleron, as if someone wanted to make clear that there would be no success in trying to find him on the island. 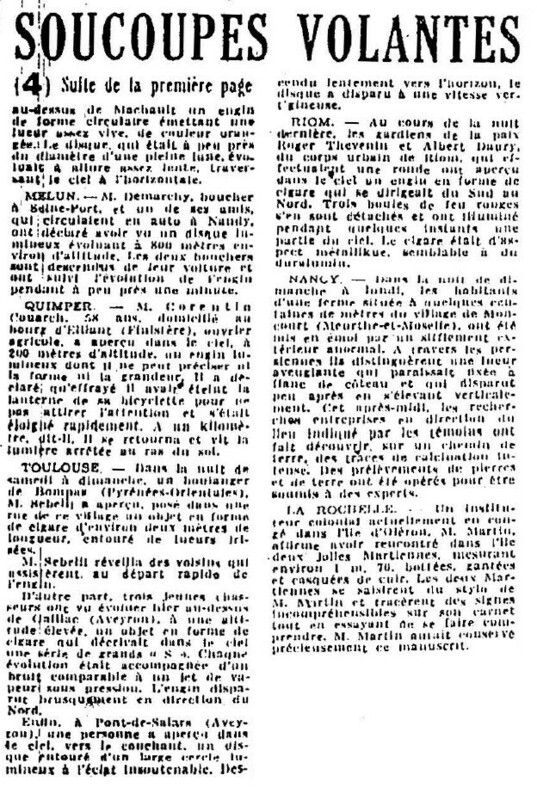 [ha1] Article in the regional newspaper Le Havre, France, page 4, October 13, 1954. [fa1] Article in the foreign newspaper Feuille d'Avis, Neuchatel, Switzerland, October 13, 1954. [im1] Article in the foreign newspaper L'Impartial, Switzerland, October 13, 1954. [ht1] Article in the foreign newspaper Hindustan Times, India, page 6, October 14, 1954. [qh1] Article in the regional newspaper Le Quotidien de la Haute-Loire, Haute-Loire, France, October 14, 1954. [hw1] "Flying Saucers Uncensored", book by Harold T. Wilkins, Citadel Press publisher, USA, 1954. [hw1] "Flying Saucers Uncensored", book by Harold T. Wilkins, Pyramid Books publisher, USA, page 245, 1974. [---] "Les Apparitions d'Humanoïdes", book by Eric Zurcher, Alain Lefeuvre publisher, France, page 179, 1979. [---] Communication by David Duquesnoy, in "Les Apparitions d'Humanoïdes", book by Eric Zurcher, Alain Lefeuvre publisher, France, page 179, 1979. [bb1] "La Grande Peur Martienne", book by Gérard Barthel et Jacques Brucker, Nouvelles Editions Rationalistes publisher, France, Paris, pp 84-85, 1979. [bh1] "UFOs and Alien Contacts - Two Centuries of Mystery", book by Robert E. Bartholomew and George S. Howard, Prometheus Books publisher, New York, USA, page 300, 1998. [jg1] "RR3 - Le Dossier des Rencontres du Troisième Type en France", book by Julien Gonzalez, Le Temps Présent publishers, France, pp 436-427, 2014. 0.2 Patrick Gross November 5, 2007 Conversion from HTML to XHTML Strict..
1.0 Patrick Gross December 20, 2008 First formal version. 1.1 Patrick Gross March 18, 2010 Addition [ht1]. 1.2 Patrick Gross September 21, 2014 Additions [ha1], [ta1]. 1.3 Patrick Gross October 10, 2016 Additions [fa1], [im1]. 1.4 Patrick Gross November 20, 2016 Additions [er1], [ub1]. 1.5 Patrick Gross December 9, 2016 Addition [gb1]. 1.6 Patrick Gross December 31, 2016 Addition [jg1]. 1.7 Patrick Gross February 12, 2017 Addition of the Summary. This page was last updated on December 31, 2016.